One Tahoe. Two Road Warriors. Ten days. Nine states. Four-thousand, two-hundred and three total miles driven. Over 800 photographs taken. It was one hell of a Road Trip! Yes, we are back from TUSRT (The Ultimate Summer Road Trip). And it was, as I assumed it would be, EPIC! A road trip of over 4,000 miles…how could it not be?? We left on Friday evening, July 23rd, about 7pm. Now I suppose that technically, I have to say the Road Trip was 10 and 3/4 days, to count this Friday evening… but really it was just us deciding that if we left as soon as possible after work that Friday, we could be that much further down the road when we began on Saturday. And indeed, we made it to my best friend’s house in Longmont, CO Friday evening (a little over 400 miles). Well, not so much Friday evening as about 1:30 in the morning Saturday. My bestest buddy had graciously allowed us to stay with her that evening, even though she had to work Saturday morning and would be asleep when we arrived. We tiptoed in through the dark garage, oh-so-quietly, flinching at the loud rattlings of the garage door closing. Through the living room we glided, the dining room, silent as wraiths… and it all went to hell when we tried to use the bathroom, as her new Doberman puppy heard us and began barking it’s head off. So much for stealth. Our late arrival meant we weren’t planning to get up too terribly early, though I did set an alarm for 7:30am, so as to have coffee with my buddy before she left for work. By the time we had showered and were on our way, it was 10:30am, Saturday, July 24th. 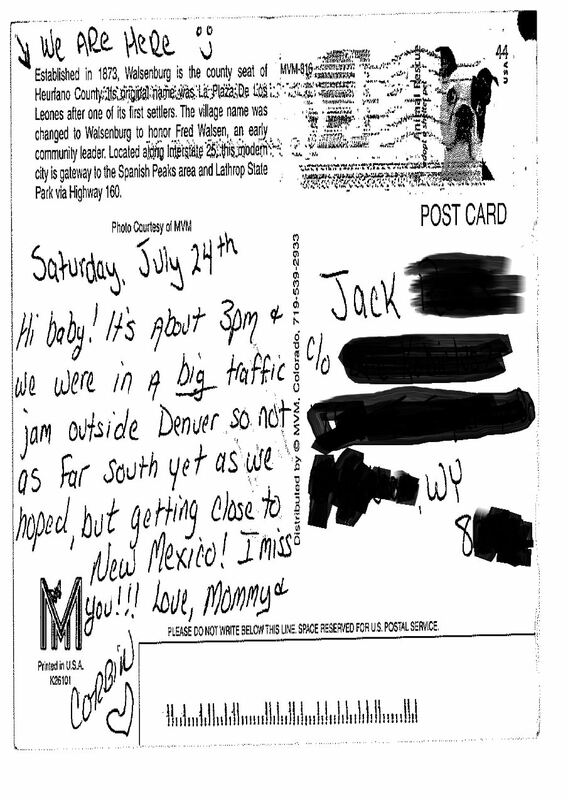 We left Longmont, CO on I-25 South, heading for Santa Fe, NM., reaching the interstate about 11am. The first thing that happened to us is that we hit a traffic jam just south of Denver, CO.
We were in that sucker for hours! 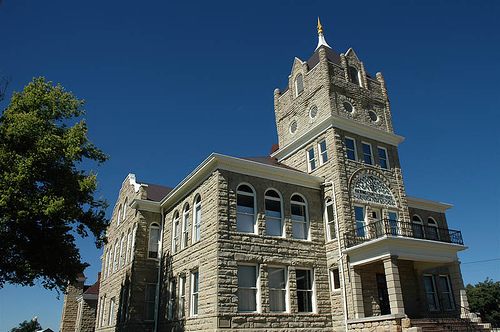 Walsenburg, by the way, is an interesting little town, very historic. It was first established as La Plaza de los Leones, and traces its history back about 150 years. 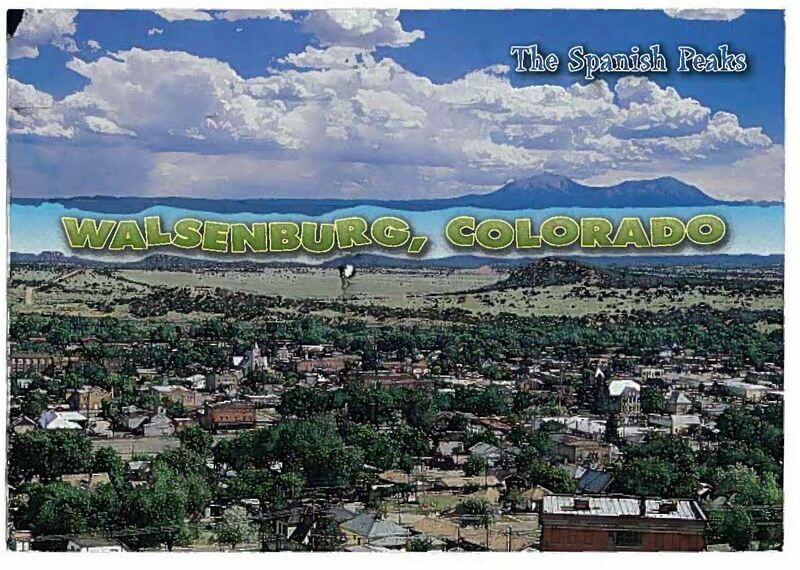 Walsenburg is also only about 50 miles from New Mexico, so soon enough we were crossing the border. By “official” Day 1 -we had three states! Wyoming, Colorado, and New Mexico. Epic! 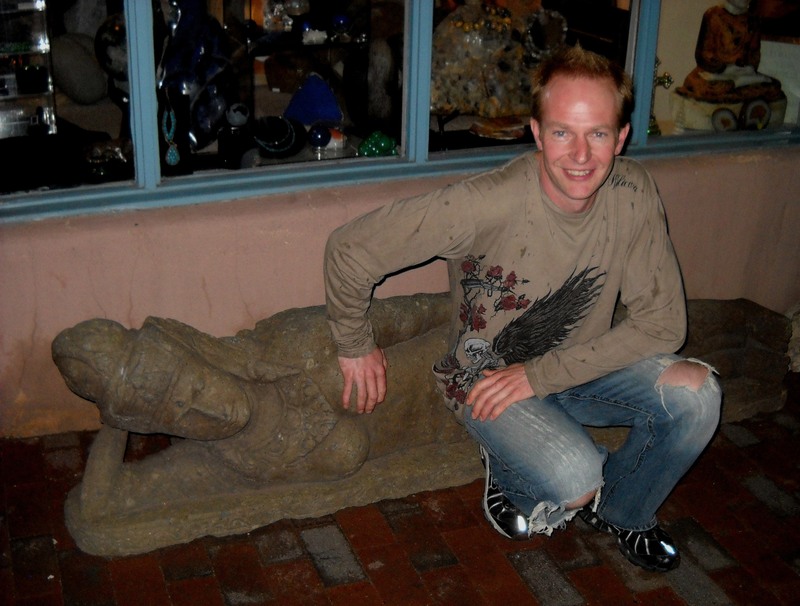 Santa Fe was our first New Mexico destination -where we could catch the pre-1937 alignment of Route 66 on to Santa Rosa. 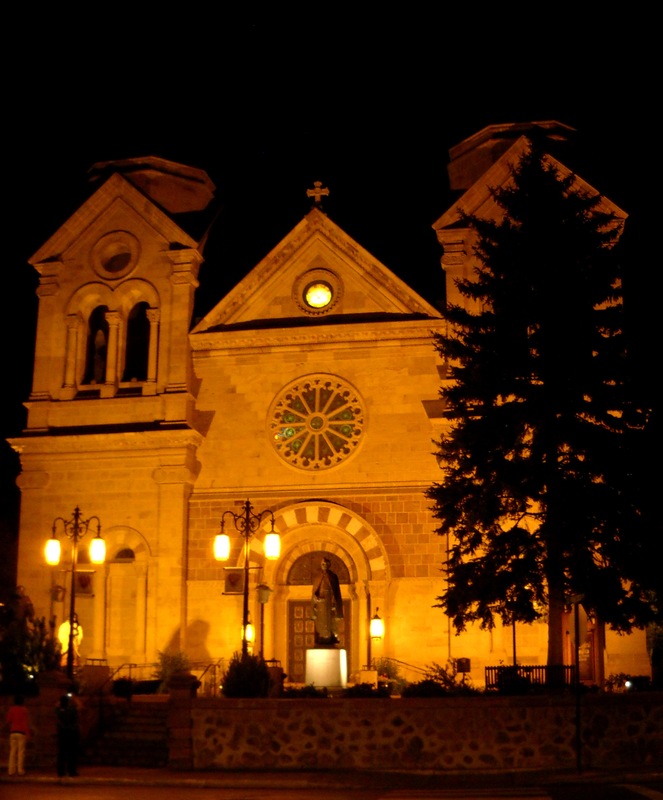 We arrived in Santa Fe just as it was getting dark -which in the summer in New Mexico apparently happens about 8pm. We were used to Wyoming summer daylight that stretches until 9:30, so were a bit surprised to be losing the light so quickly. 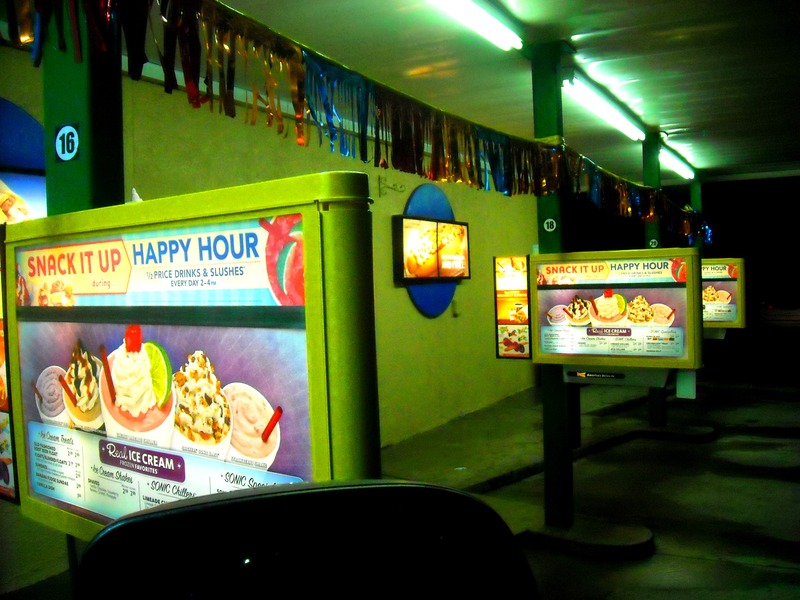 Thus, I was still driving as we headed into the city of Santa Fe, and my night vision is not the best. Especially on 4 hours of sleep. 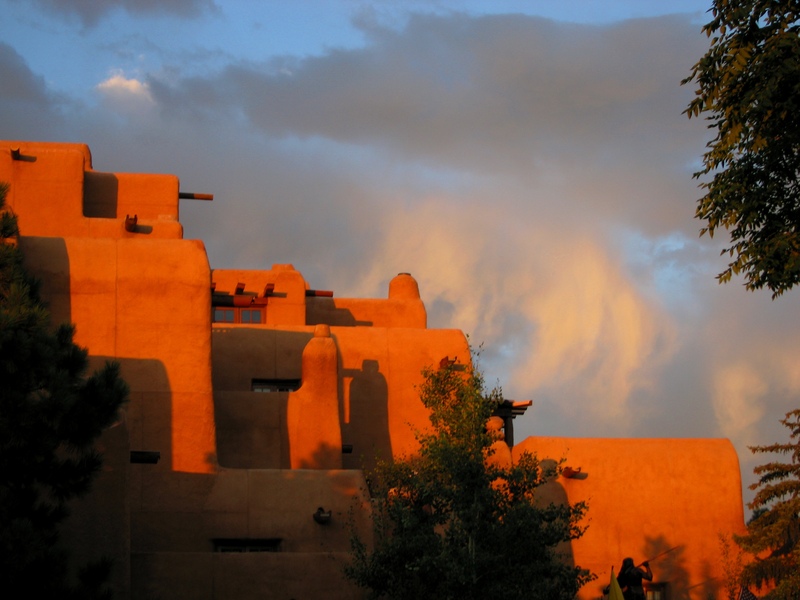 We knew we wanted to see the oldest section of Santa Fe; Santa Fe, which was already an established community with a small cluster of European type dwellings thirteen years before Plymouth Colony was settled by the Mayflower Pilgrims. 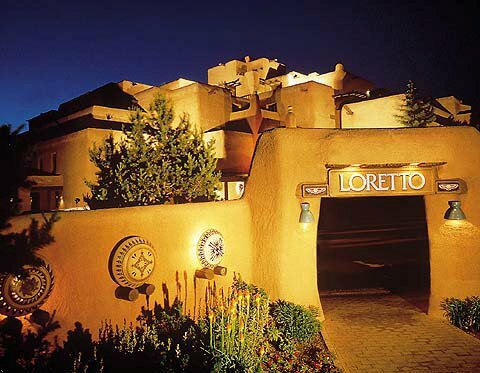 Santa Fe is the oldest capital city in North America, the oldest European town in America, and was the capital for the Spanish “Kingdom of New Mexico”. We had no idea where the old part was, though. And I was too tired to try to figure it out. I took the first exit and never switched lanes -even when the lane I was in turned, curved, or headed over yonder. 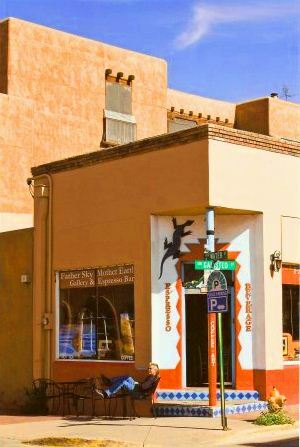 We spied an espresso shop in a little nest of Pueblo looking structures and pulled over. While ordering our lattes at the “Father Sky, Mother Earth Gallery and Espresso Bar”, we chatted a bit with the gentleman behind the counter. He informed us that whenever he traveled, the first thing he did was to identify three things. A java shop for his morning coffee. A pub for his evening brew. 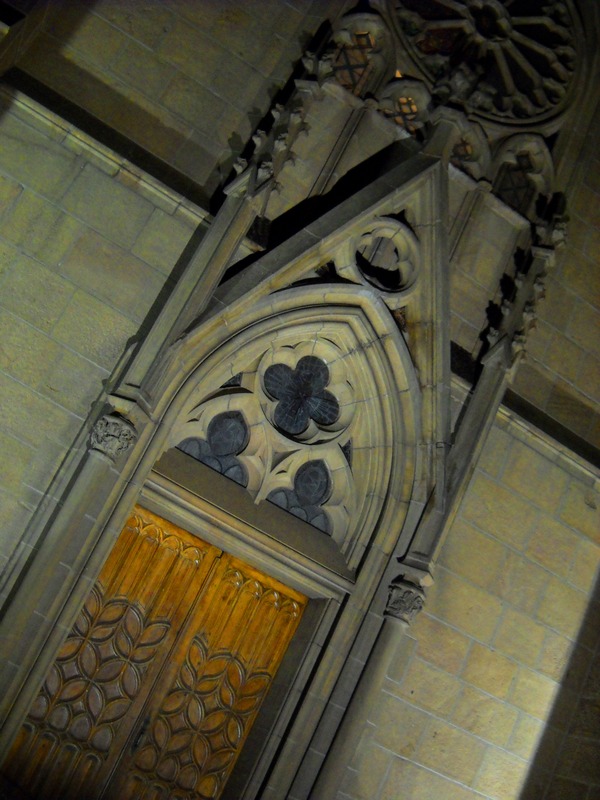 And the area’s sacred places for however much time he had to give to ceremony. He also told us we were standing in the middle of Santa Fe’s oldest settled region. The Santa Fe Plaza. By complete luck, we had arrived in the old town. And do you know what ran right through it? 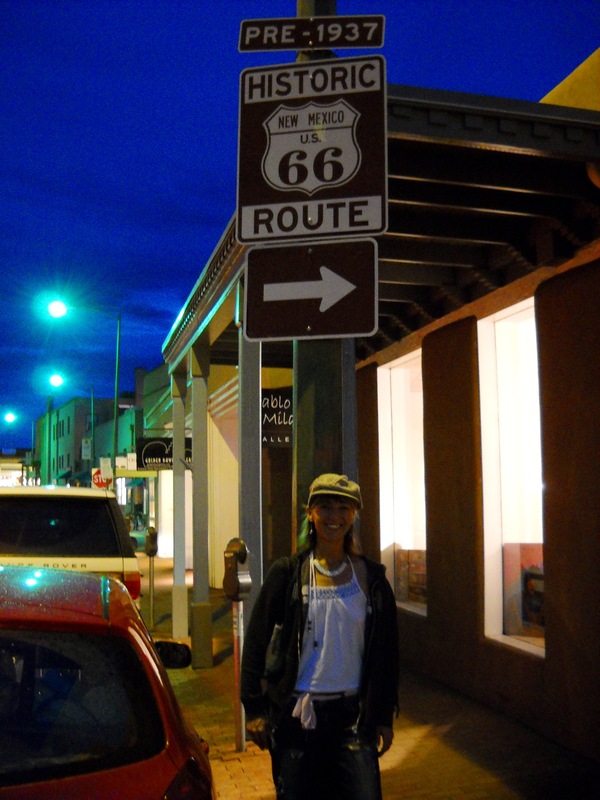 The pre-1937 alignment of Historic Route 66. Full of vintage fast-food yumminess, we parked in a darker, tree-shaded corner of the Holiday Inn parking lot. Inspired, really. There is always a lobby level bathroom in a hotel of this size, and the lobby doors are open all night long. The parking lot is secure, yet a vehicle parked in it all night with sun-shades in the window will not seem odd to security. The only small catch was that at this point, we had not yet put up the air mattress in the back of the Tahoe. The brief moments that my husband spent pumping up the mattress with our small hand-pump seemed like an eternity as the pump squeed and whistled into the deep silence of the parking lot. Whee!! Squee! Weez! Finally, after a trip to the lobby bathrooms, we were all cozily tucked away in the back of the Tahoe on our soft, quilted, traveling bed. We slept like the Dead.